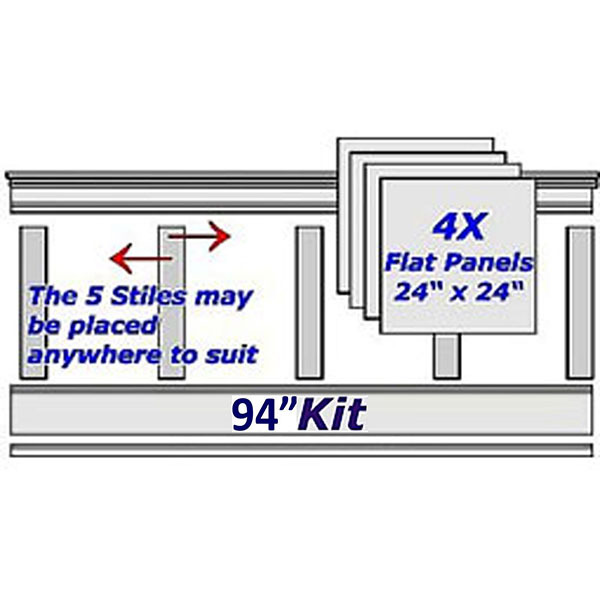 Flat Panel Wainscoting 8 ft Kit, consisting of two packages a 8 ft Rail kit RPW-RAILS - and a 4 flat 1/8" thick panels 24" height by 24" wide and 5 stiles. The 4 - 24" x 24" Panels are made the perfect height, only the length requires cutting on site. The panels are made from 1/8" thick MDF board, and can be easily cut on a portable table saw, on the job site to suite any layout. This kit is suitable for an overall wainscot height of between 37" and 42". Material: Medium Density Fiberboard (MDF) Click here to learn more about Medium Density Fiberboard (MDF).